Silence, they say, is golden. Personally I'm more concerned with gaming frame rates, but when something comes around offering zero dB sound levels and decent gaming speed, I'm going to sit up and take notice. 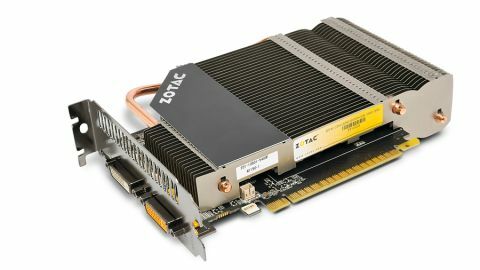 And Zotac's GT 640 Zone is certainly making me take notice. Now, I'm not saying that this is a proper gaming card on par with the likes of the HD 7770 or HD 6850, but considering its stealth credentials and bargain sticker price, it's certainly worth a look in specific circumstances. And what might those be, I hear you ask in the shadowy recesses of my head? Well, we've been checking out the power of the modern mini PC, and this would be an ideal card for a little chassis that you're keeping in the lounge. Y'know, somewhere you don't want to be filled with the sound of a jet turbine on full afterburn every time you boot up a 3D game. It's also useful if power draw is a real concern for you. With no PCIe power connectors necessary for the smooth running of this Kepler-GPU powered card, it's perfect for those with a paucity of spare power leads on their PSU. Before you get too excited about the prospect of a passively cooled Kepler card flinging polygons around your screen with DirectX 11 abandon, we should point out that 'decent gaming speed' does not mean super-smooth high-fidelity gaming. The GK107 GPU inside this GT 640 only comes with a pair of the upgraded Kepler SMX modules, giving it a total of 384 CUDA cores to do its bidding. Like most of the GT 640s you'll see in the wild, this is also making do with the creaking GDDR3 memory on its 128-bit memory bus. So if you were hoping for a silent graphics card capable of hitting the top settings at 1080p and delivering average frame rates in the 30s, then keep on dreaming. Well, either that or take a look at what AMD and Sapphire are doing with the HD 7750 Ultimate. The Cape Verde GPU at the heart of the HD 7750 is a little more gaming capable than the GK107 chip, offering an extra 10fps at 1080p in both DiRT 3 and Batman: Arkham City. It is a pricier card though, to the tune of around £10-£15. The HD 7750 will probably need settings to be adjusted down for most modern games though, just like the GT 640 Zone here. In fact, during our benchmark tests we had a quick play with Batman: AC and the newer DiRT Showdown at lower settings, and the Zone was capable of some excellent gaming speeds. Just by dropping down to the High setting and switching to 2x anti-aliasing, we managed to hit 43fps and 38fps in Bats and Showdown respectively. That's more than enough for a silent lounge PC with a penchant for a little light gaming. You'd struggle to cope with a swarm of Day-Z's zombs on this card, but if you fancy some casual/arcade fun it's still got some chops. For the asking price, this is a decent little silent card. If noise is a big bugbear for your build then it might well prove to be the bargain-busting answer you've been searching for.